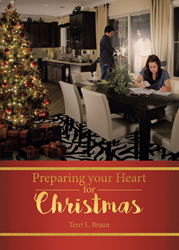 “Preparing your Heart for Christmas” from Christian Faith Publishing author Terri L. Braun is an inspirational guide for followers of Christ who seek to enhance their spiritual journey around this sacred holiday. It enables readers to see through distracting tasks like decorating and seeking out gifts, and focus on the most important gift of all – Jesus Christ. “Preparing your Heart for Christmas”: a devoted and honest guide for those looking to enhance their spiritual journey. “Preparing your Heart for Christmas” is the creation of published author, Terri L. Braun, a graduate of Fort Hays State University with a degree in psychology who has worked at her local mental health center for over two decades. In 2014, Terri sustained a traumatic brain injury. This inspired her to write her first book, “Good Morning Sunshine: Finding Strength and Comfort in God,” about how God’s Word lifted her up during her recovery. This second book continues her mission to share God’s love. “During the Christmas season, the busyness of the world can be distracting. It is filled with fuss over decorations, finding the perfect gift, and Elf on a Shelf. There are Christmas concerts, Black Friday, and family gatherings. These distractions prevent us from realizing what is truly important,” says Terri. Published by Christian Faith Publishing, Terri L. Braun’s new book encourages readers to discover what distractions are preventing them from fully experiencing and enjoying their spiritual journey. Christmas is a busy season for everyone, and there are a lot of different tasks to be accomplished to prepare for the highly-anticipated holiday. Instead of focusing too much on the preparation required for the celebrations and activities during the season, this book calls each reader to focus on the preparation required for the heart and soul while they celebrate the birth of Jesus. View a synopsis of “Preparing your Heart for Christmas” on YouTube. Consumers can purchase “Preparing your Heart for Christmas” at traditional brick & mortar bookstores, or online at Amazon.com, Apple iTunes store, Kobo or Barnes and Noble. For additional information or inquiries about “Preparing your Heart for Christmas”, contact the Christian Faith Publishing media department at 866-554-0919.